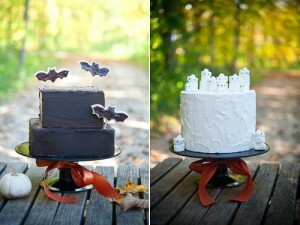 While I’m not a HUGE fan of the macabre holiday, I do like the cuter aspects of it. And when it intersects with all things mysterious, chilly, and autumn-like, well, that’s just perfection. 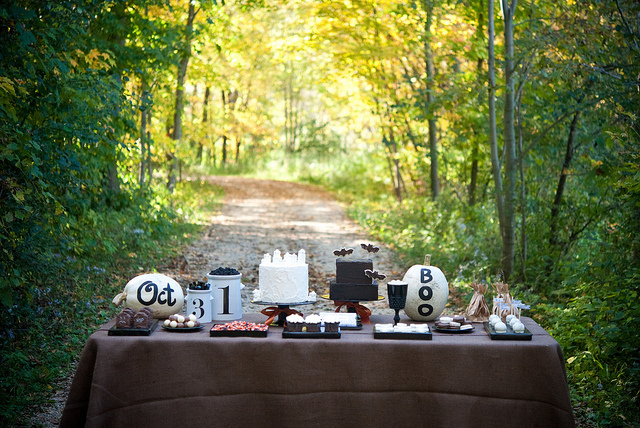 Shauna Younge, creator of lovely dessert tables in the Minneapolis area, created this pretty display, and termed it her “Totally Target Halloween dessert table using ingredients, dishes, and products found at Target so my blog readers could easily, affordably recreate the look.” LOVE. THIS. Because seriously, how often do we see things that take our breath away, but there’s no way we could even approach them in real life?? (You and your gold leaf. Yes. You.) But if I know I can hop in the Honda and head down to Target for all of these cool finds, I can totally do this. I think this would make a seriously cute table for a Halloween-time wedding. Check out Shauna’s Flickr stream for more pics of the fabulousness.